In the hospital setting, tablet computers get dropped or thrown around. When clinicians bring their own devices (BYOD), they tend to be much more cautious with their devices. However, there are plenty of iPads that are issued by the hospitals. Given that the Apple iPad is so popular among physicians, nurses, and students, the use of rugged cases in the health care environment makes sense if you want to protect it from drop damage. 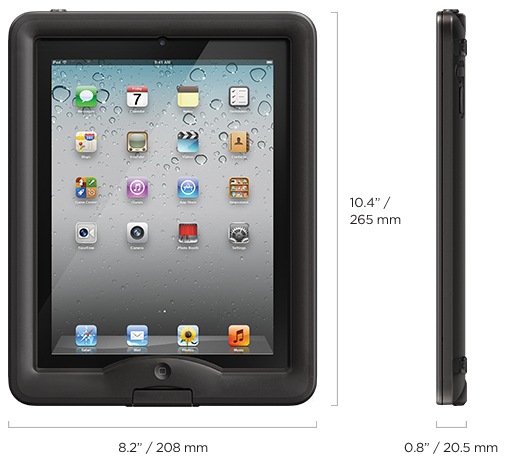 I recently had the opportunity to test the LifeProof nüüd case for the iPad. They were demonstrating their cases at the recent mHealth Summit. The LifeProof nüüd case makes your iPad waterproof and rugged while allowing you to use the actual, naked screen on your device. No screen protector (although Zagg offers an Invisible Shield screen protector that is shaped specifically for this case). The case is amazingly light (0.7 oz) and made to meet Military Standard 810F-516 for functional drop from 4 feet. The ports remain covered with plugs so that the case is submergible to 6.6 feet for 30 minutes. Even with the rugged, waterproof protection, the case allows you to hear the audio from your iPad amazingly well because it channels the sound through the case cavity, thus amplifying the sound. I was impressed by the sound performance. The case attaches to a separate stand so that you can prop it up at different angles for typing and viewing. There are hand straps and shoulder straps that can attach directly to the case. You can even get an orange floatable "jacket" called the LifeJacket that will ensure that your iPad floats if you drop it in a lake. This spongy piece of foam gives your iPad additional shock protection. It's what I'd recommend if you plan to let your kids play with your iPad.